These tiny spoons are so cute; we could not resist bringing them to you. Almost doll size (our daughter uses then for her doll dinner parties); they are perfect for serving salsas and other sauces. They also fit great on appetizer plates, and perfectly serve as spice, sugar, or salt spoons. Wooden utensils have been used since mankind started cooking food, and are still an essential and beautiful addition to any kitchen. Being lightweight and strong, they have the added benefit of not scratching delicate surfaces such as Clay Cookware and non-stick pans. Wooden utensils need special care in order for them to last. Not taken care of properly, they can crack and lose their attractive finish. Here are a few tips to keep your wooden utensils a long time. Since wood expand in water, letting the utensils soak in water, such as a dishwasher is not a good idea as the constant swelling and shrinking will cause the wood to crack over time. Always hand wash wooded utensils after every use with mild soap and warm water, as soon as possible after use to prevent food from drying on them. If food does become dry, use a gentle scrubbing pad so as to not damage the surface. If the wood develops a musty odor, you can also add a teaspoon of baking soda to the dishwater. Dry wooden utensils with a towel instead of letting them air dry to make sure it does not stay in contact with the water a long time. To keep your wooden utensils looking like new, it is a good idea to rub a little mineral oil on them with a soft cloth every month or so. This will restore the warm polished look and keep the wood in good condition. Mineral oil is a food safe product that won't go rancid, gets absorbed quickly, and leaves the wood smooth but not greasy. If you are worried about harmful bacteria, you can sanitize your wooden utensils from time to time, especially if they have come in contact with food products that may harbor harmful bacteria. 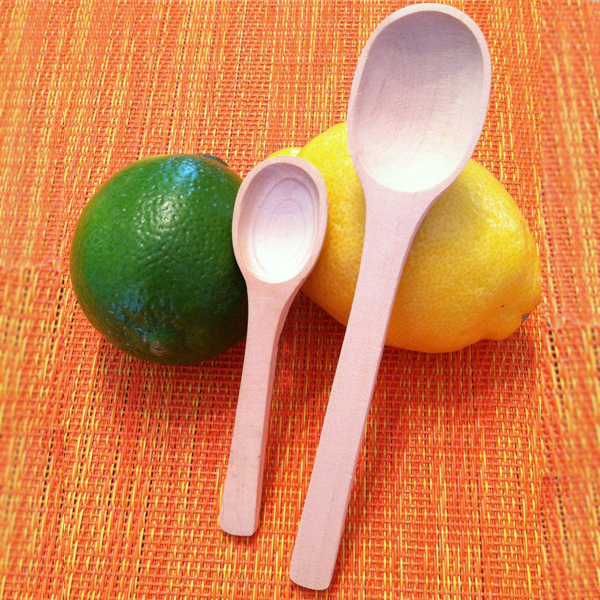 To sanitize wooden utensils, pour 3 percent hydrogen peroxide over them as they lay on a flat surface. After fifteen minutes or so, rinse and dry them as described above. Since wooden utensils may have tiny cracks that can harbor harmful Bacteria, Always avoid using them to handle raw meats and chicken to prevent cross-contamination.